St John’s Gate, a red-brick structure faced with ragstone near the centre of Clerkenwell, north London, has had a number of interesting uses over the past 500 years. 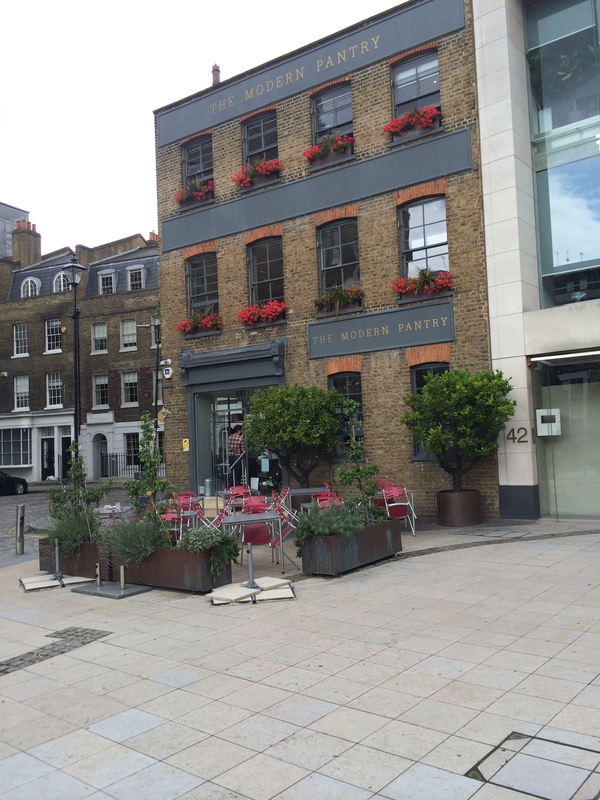 In the early 18th century it housed a coffee shop, run the father of William Hogarth, the artist. Latin was reputably the only language that customers and staff were allowed to speak. Then it was a the house and printing works of Edward Cave, who founded the Gentleman’s Magazine and employed Dr Samuel Johnson to write reports. Later still, it was home to a pub, the Old Jerusalem Tavern and was visited by Charles Dickens. The gatehouse was originally built, in 1504, as the southern entrance to the Priory of Clerkenwell, a large religious complex forming the English home of the Knights of the Order of St John of Jerusalem. As I wrote last week, the organisation founded of a hospital to care for sick Christian pilgrims in 11th century Jerusalem who had travelled there on the Crusades. 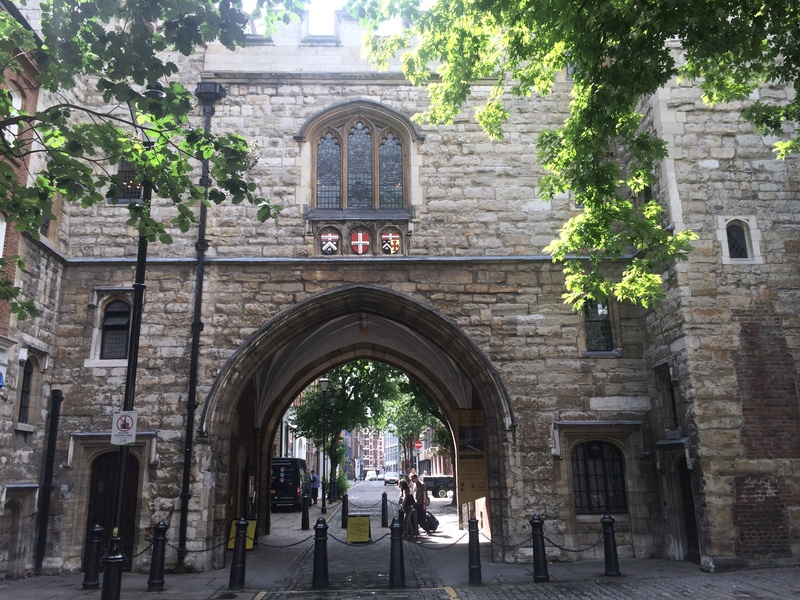 But given the Priory of Clerkenwell was set up in 1144 and closed in 1540 as part of Henry VIII’s Dissolution of the Monasteries, St John’s Gate was built relatively late on in the site’s life as a religious institution. Now it acts as the entrance and shop for the museum charting the history of the Order – through various artefacts collected by the Order since its foundation – and St John Ambulance. Today, the Crypt in the otherwise more modern Priory Church is the only surviving part of the original 12th century structure (and is indeed one of just a few remaining fragments of Norman London fabric). Descending the narrow flight of stairs to these rooms is very atmospheric, aided by the use of soft lighting. In the north chapel, visitors can see the skeletal effigy from the tomb of William Weston, Prior of England in 1540 when Henry VIII’s Dissolution Act went through parliament. But unlike those in other religious institutions he was not pensioned off as he is said to have had a heart attack and died on the very day that the legislation was passed. There are a number of other interesting artefacts from the Order’s history in this space, including a tomb sculpture portraying a knight in full armour and a rescued Norman font that for a number of years was used as a cattle trough in Wiltshire. The outline of the original round 12th century nave can be seen marked out in white cobbles in St John’s Square, just in front of The Modern Pantry. Most of the church structure seen today was built in the 16th century, with much modification in the years that followed. Unfortunately however it was badly damaged by the Blitz in 1941 and so a new façade and porch needed to be added in 1960. Inside, banners on the north wall represent establishments of the Order around the world, which stretch as far afield as South Africa and Australia. Paintings on the wall are mainly of the Knights of Malta and were donated by Sir Victor Houlton, one time Governor of Malta. But, when it was a functioning Priory, the church was just one part of this busy religious complex, with dormitories, two large halls, a refectory, buttery, counting house and kitchens, plus land for growing fruit and vegetables and space for keeping animals. Accounts reveal that in 1338 there 75 people in total living at the site, including a Prior of England and a commander, the latter overseeing the smooth functioning of the estate. Following Dissolution, the old Priory became a storehouse used by Henry VIII and in the late 16th century part of the complex was the home of the official office responsible for providing performance licenses for plays from Shakespeare and his contemporaries. St John’s Gate was, as has already been discussed, used at various times as a coffee shop, printers and pub. 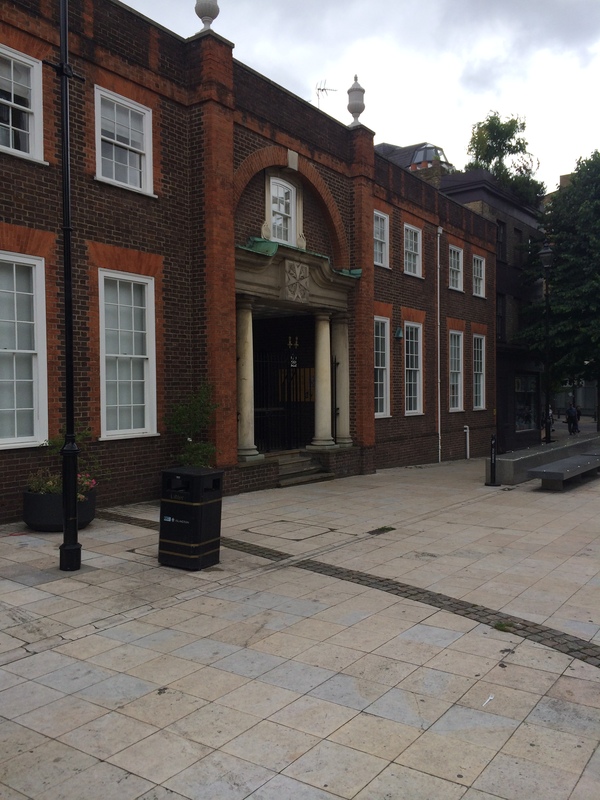 Clerkenwell has changed enormously in the years following Dissolution, with much of the land belonging to the old Priory being built on and used by businesses and homes. The Priory church itself became a second parish church for Clerkenwell, before being passed back to the Order of St John when the area’s population fell in the 1930s. The Order still survives and has its international headquarters in Rome, its home since the Knights were kicked out of Malta by Napolean in 1798 (see my blog last week for more details). In England, the modern Order of St John was given a Royal Charter in 1888 by Queen Victoria, recognising the effort that had gone into setting up St John Ambulance in 1877. That charity, which continues the work began in industrial Britain in providing first aid training services to the public, today has its UK headquarters next to the museum. 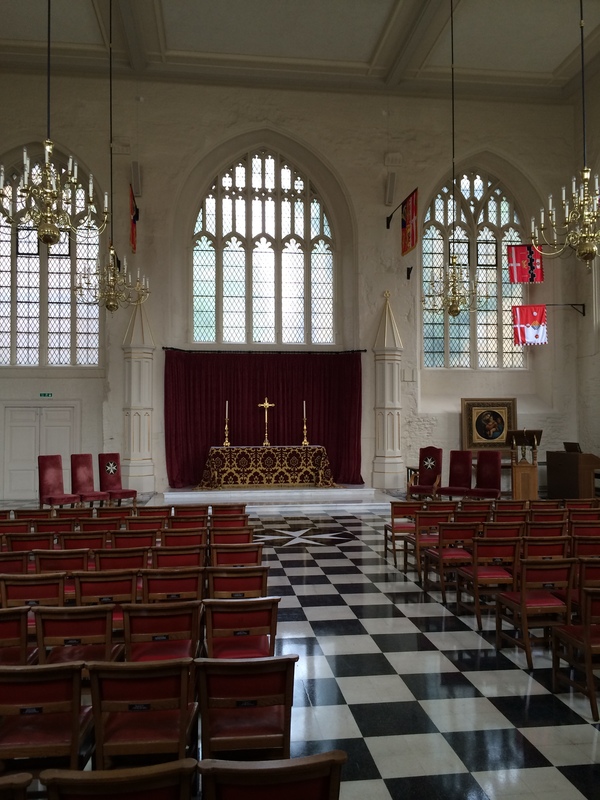 The Order’s church is still used, including for inauguration services for new members, and can be visited on a guided tour. Weddings and other functions regularly make use of the splendidly lavish rooms connected to St John’s Gate, such as the late Gothic-style Chapter House, with drinks and canapes also served in the peaceful setting of the recently renovated Cloister Garden.